Your Mondays just got better! 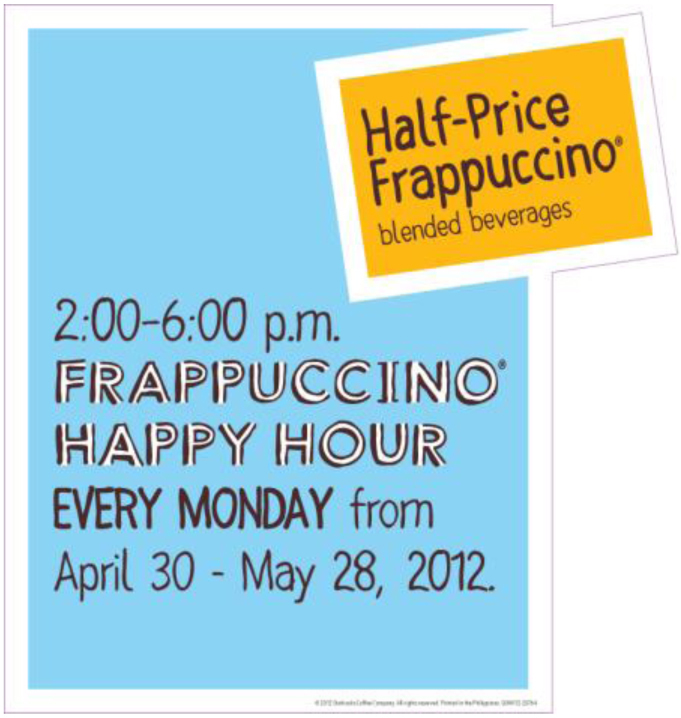 Half-off Happy Hour only at Starbucks. - Hello! Welcome to my blog! WHAT: Every Monday from April 30 to May 28, 2012 (2pm to 6pm), meet at Starbucks for Frappuccino Happy Hour and enjoy half-priced However-You-Want-It Frappuccino® blended beverages. 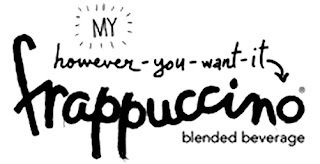 Customers can personalize their Frappuccino® blended beverage just like their favorite hot drinks at Starbucks. With thousands of options, choose from a variety of milks or soy, request the coffee intensity and pick any combination of syrups or toppings.  NEW! Mocha Cookie Crumble Frappuccino® Blended Beverage – A delicious blend of chocolate cookie bits, our signature Starbucks® Frappuccino® Roast coffee, rich mocha sauce, vanilla syrup, milk and ice, finished off with whipped cream, chocolate drizzle and a cookie crumble topping.  Strawberries & Cream Frappuccino® Blended Beverage – This classic recipe is made with our strawberry sauce, milk, blended with ice and topped with whipped cream is sure to surprise and delight. Dairy-sensitive customers now have the opportunity to customize this beverage with the type of milk used (whole milk, non-fat milk or soy). 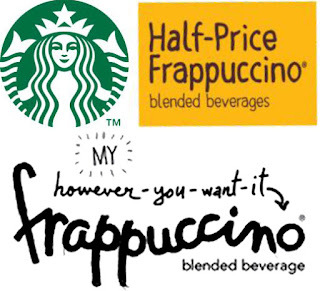 To keep this beverage free from dairy, order without whipped cream. 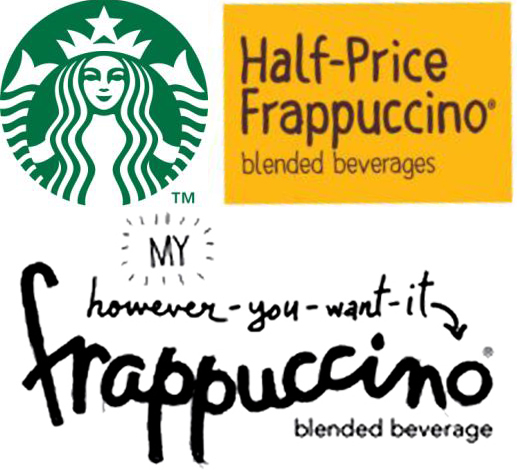 and their new food offering http://mixofeverything.blogspot.com/2012/04/new-food-items-at-starbucks.html.